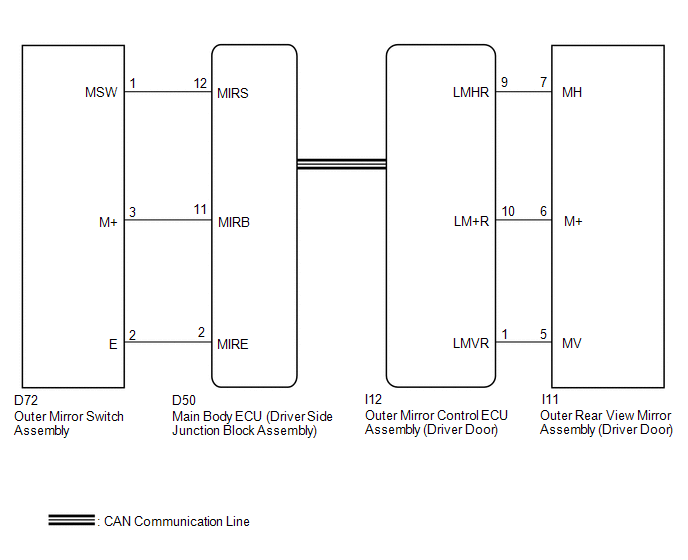 When the mirror adjust switch is operated, the main body ECU (driver side junction block assembly) detects the switch operation and sends the mirror adjust switch signal to the outer mirror control ECU assembly (driver door) via CAN communication. On receiving the signal, the outer mirror control ECU assembly (driver door) operates the vertical and horizontal mirror motors, which are built into the outer rear view mirror assembly (driver door), to adjust the mirror surface position. Check with the mirror select switch in the L position. (a) Enter the following menus: Body Electrical / Mirror L / Active Test. 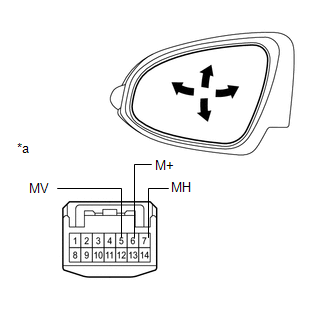 (a) Remove the outer rear view mirror assembly (driver door) (See page ). (1) Apply battery voltage and check the operation of the outer rear view mirror assembly (driver door). 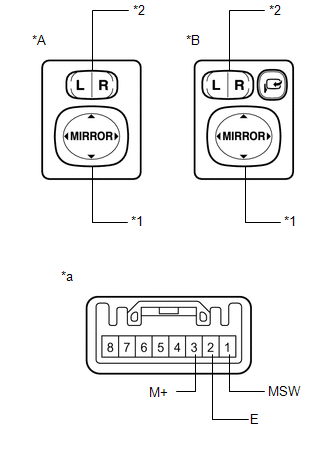 (a) Disconnect the I11 connector from the outer rear view mirror assembly (driver door). (b) Disconnect the I12 connector from the outer mirror control ECU assembly (driver door).